Highland quarterback Ian Taylor scrambles for yards against the Mount Gilead defense on Friday. Nathan Rogers prepares to throw a pass for Mount Gilead Friday. 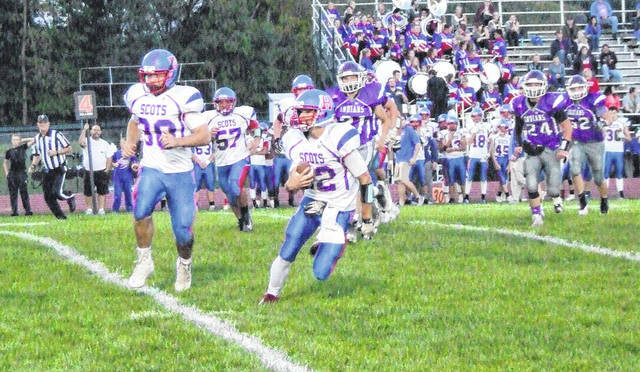 A fast start combined with a great defensive showing was enough for Highland to claim a 58-0 win at Mount Gilead on Friday night to improve to 5-1, 3-0 in league play. MG is still looking for their first win on the year. It didn’t take long for the Scots to light up the scoreboard. After receiving the opening kick, they immediately got a 68-yard scoring run from Jack Weaver to lead 6-0 with fewer than 30 seconds elapsed in the contest. On Mount Gilead’s first drive, they’d quickly move the ball to midfield on a personal foul called against the Scots. However, the drive would then stall and Highland got the ball back on their 17. Highland then ground out a 15-play drive that took nearly six minutes off the clock. On that drive, they converted three fourth-down plays. Brock Veley ran for 16 yards on a fourth-and-eight situation on the Scot 49. Later, facing third-and-14 from the MG 39, the team got a 12-yard pass from Ian Taylor to Weaver to set up a short fourth down that was converted on the ground. Then, on a fourth-and-19 from the Indian 27, Taylor struck again, connecting with Brody Matthews through the air for another touchdown. Tate Tobin’s two-point run made it a 14-0 game. Highland would get another touchdown in the opening period, as Matthews reached the end zone again on a 10-yard run on the final play of the quarter. Tobin got another two-pointer to boost the lead to a 22-point margin. MG turnovers put the game out of reach early in the second quarter. 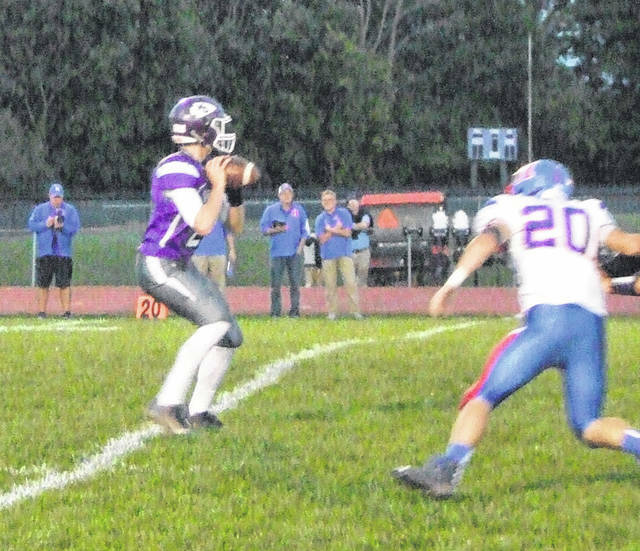 A 28-yard pass from Nathan Rogers to Owen Blanton moved the ball into Highland territory at the 41-yard line, but facing third-and-15 from the 46, a high snap went over the junior quarterback’s head and was recovered by Tobin for a touchdown. This time, it was Matthews running it in for two points to make it 30-0. On the next Indian possession, Rogers threw a pick that Cam Cutrone returned to the two-yard line to set up a short scoring run by Matthews. Riley Kemmer followed with the first of four successful extra point kicks and it was 37-0 with 9:32 left in the half. MG got a quick 20-yard run by Colton Cronenwett to get near midfield on their next drive, but the team wasn’t able to cross the 50 and had to punt again. Ulrey noted that his team simply has to string plays together to be successful. A 59-yard run by Tobin ended the first half’s scoring, with Highland up by 44 points. In the second half, with a constantly-running clock, the Scots added a pair of fourth-quarter scores on two yard runs by Garison Hankins and Jon Jensen to provide their final margin of victory. After his team recorded its first shutout of the season and outgained MG by a 419-76 margin, Carpenter was happy with his team’s defensive effort. “They did a really good job of keeping them in check,” he said. In a game where 15 Scots ran the ball, Tobin finished with a game-high 83 yards, while Weaver added 75. Taylor connected on four passes for 62 yards through the air, with both Matthews and Weaver recording two catches. MG got 31 yards on the ground from Aaron Baer, while Rogers completed five passes for 32 yards, with Blanton’s grab being the longest reception. Carpenter now hopes his team can maintain its KMAC success in its next game, at home with Fredericktown.